An excellent craft for the beginner, crochet allows you to create beautiful items of clothing, accessories for your home, and a variety of other projects with just a hook and some yarn. The actual word crochet comes from an old French word, croche, meaning hook. Although crochet has been around for a long time, no one seems to be able to agree on when or where it started. Renaissance women created lace fabrics by using a type of crochet technique, but the modern version of crochet did not appear until the last part of the 1700s. By Victorian times, women were using crochet as a way to embellish almost every surface in their homes. Brides-to-be crocheted hundreds of lace edgings, doilies, and other items in preparation for married life. In the early part of the 1900s women often crocheted while listening to the radio in the evenings as a way to keep their hands occupied. Although crochet never really went out of style, it experienced a revival in the 1960s when crocheted clothing became very popular, and it has remained a popular craft since that time. It is very easy to begin crocheting. First, you will need to stop by your local crafts store and pick up yarn in any color you like and a crochet hook. Size "D" or "E" should be just right. Hold the crochet hook firmly in your right hand. Make a slipknot on the hook. Bring the yarn over the hook from back to front. Grab the yarn with the hook and pull it through the slipknot. Grab the yarn with the hook and pull it through the loop. This is called chaining or making a chain. It is often abbreviated "ch." It is the basis for all crochet projects. When you are learning beginner crochet, you should practice the chains until you can make them all the same size. This is very important later on.Once you have the chain stitch down, you are ready to move on to basic stitches. 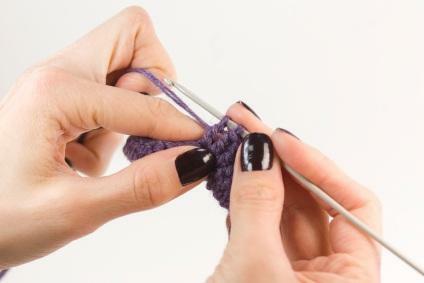 There are a few basics stitches, in crochet and almost all of the other stitches are a combination of the basic ones. Once you have these mastered, you will be able to make almost anything in almost any pattern. The single crochet stitch is often abbreviated "sc." It is a simple stitch that creates a very heavy fabric when it is crocheted. Chain 20 stitches, leaving a loop on the hook at the end. Turn your work so that your hook has the chain in front of it. Skip the first chain. Insert hook into the center of the next chain stitch. Pull the yarn through the stitch and up onto the hook so that there are two loops on the hook. Bring yarn over the hook (abbreviated "yo") from back to the front and pull it through both loops on the hook. One loop is still on the hook. That is one single crochet. Repeat the rest of the way across. When you get to the end of the row, make a chain stitch and turn. Repeat as many times as the instructions require, or until your project is as long as you want it to be. Double crochet, abbreviated "dc," is another good beginner crochet stitch. It is almost the same as the single. Start with a chain the size you need. If you are just practicing, 25-stitch chains will be fine. Insert hook in the center of the second chain stitch from the hook. Pull the yarn over the hook. Pull the yarn through the stitch. There are now two loops on the hook. Pull the yarn over the hook. Pull it through the two loops that are on the hook. Pull the yarn over the hook again, and pull through the last two loops on the hook. Repeat as needed or as the instructions require. Once you have these stitches mastered, you will be ready to create simple projects and practice your new skill. There are many beginner crochet patterns on the Internet. Here are a few to get you started. Beginner crochet stitch instructions and patterns are available on many different sites on the Internet. Stick with simple patterns at first, and move to increasingly more challenging ones to keep you learning and improving your crochet skills.